The high cost of rent and student accommodation in Galway city has proved something of ‘a blessing in disguise’ for Irish Rail. Figures reveal that there has been an increase of a staggering 60% in train usage between Limerick and Galway over the past six years. And while many critics of the rail line argue that it is mainly used by elderly and other non-paying customers, Irish Rail say that the increase in passenger numbers between the two cities is also an indication of the current accommodation crisis that exists in Galway. A spokesman told the Galway City Tribune that they had reduced the single fare between Galway and Limerick to under €7.50 and that this had resulted in a large volume of students now travelling to college on a daily basis. Passenger numbers between the two cities were as low as 180,000 to an impressive 352,000 last year which showed a significant increase in the number of students and workers using the service. 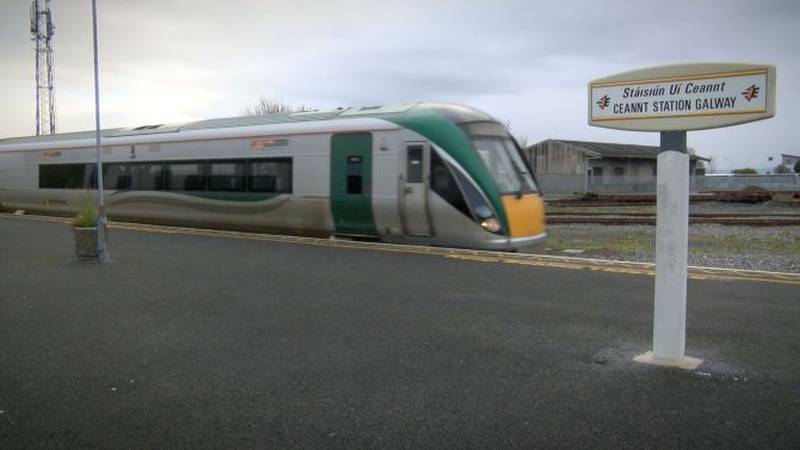 Irish Rail put the success of the service, which also takes in the much-maligned stretch of railway between Ennis and Athenry, down to the fact that the cost of accommodation in Galway City has grown at a phenomenal rate. That combined in a reduction in the fare being charged between the two destinations has contributed to the numbers being bolstered in recent years in particular. Back in 2013, Iarnród Éireann undertook an extensive appraisal of the route to identify growth possibilities to increase passenger numbers. The company noted the rising cost of accommodation in Galway city and decided to make train travel more affordable – and particularly for students. “Taking everything into account, it was determined that the optimum way to drive significant volume onto the route was to price the tickets at a similar level to bus equivalents,” an Iarnród Éireann spokesperson said. This involved a reduction in train fairs by around 50%. The company described it as a “significant initiative which ignores traditional rail pricing policies” but it has worked a treat with spiralling passenger numbers in recent years. The price reductions were introduced in the fourth quarter of 2013 and following an extensive local promotion in both Galway and Limerick, it proved hugely popular with students and younger workers. “Since we have introduced these measures, we have seen growth on this route over other routes in the region – admittedly from a low base. “Our future plans are to continue to drive usage through aggressive pricing,” the spokesperson said, adding that student accommodation in Galway City can cost anything between €3,500 and €5,000 a year during college term. While usage increases to the tune of nearly 60% has been experienced on the Galway to Limerick line, the comparable numbers are much smaller for Galway to Dublin (28%), Westport to Dublin (13%) and Sligo to Dublin (10%). A WORD IN YOU EAR Fr Micheál MacGreil, the Patron of West on Track, speaks with the then Minister for Transport Noel Dempsey at a conference to discuss the Western Rail Corridor being extended to Claremorris in 2009 in the McWilliam Park Hotel in Claremorris. Despite support from the Minister then, the project is still awaiting a go-ahead from Government. It is to be welcomed that Minister for Transport, Tourism and Sport Shane Ross has recently announced that he is set to carry out a fresh financial and economic appraisal of the merits of the Western Rail Corridor. Campaigners have long called the idle Athenry to Claremorris railway line as the ‘missing link’ in Ireland’s rail infrastructure and it is long past time that the Government see the benefits for this infrastructure, bite the bullet and proceed. An expert working group lobbying for the provision of the railway estimate it will cost €100 million, possibly less, to have it operational again. On one level it is a significant amount of money. But it is a critical piece of infrastructure which has been held up on blocks for far too long. Look to the east and the planned Dublin Metrolink project if you want to see a contrast. The Metrolink is a huge undertaking and while there is no doubt a pressing current need for something to alleviate the traffic and transport chaos in the capital, there can be little doubt that the Government find themselves where they are now due to repeated failures of previous regimes to see what was coming down the tracks. Allowing Dublin’s growth to spiral out of control and making only token gestures at balanced regional development have left the capital absolutely bursting at the seams. And, still, there is no questioning of much of the decision making and spending in the capital. In a recent column in The Sunday Business Post former Tánaiste Michael McDowell highlighted this very point. Writing in the paper on Sunday, July 22, McDowell said the Dublin Metrolink project is ‘rapidly emerging as a scandalous example of everything that is worst about policy-making and governance in Ireland’. “Some €170 million of taxpayers’ money has already been spent on the project. That is a vast sum. There was never any debate or parliamentary approval for that expenditure,” he wrote. He argues so much has been spent that it is almost too late to shout stop. By its end it will, he says, cost €3.5 or €4 billion. And down here we await for an age approval for a fraction of that and have to fight far harder and justify it far more than the €170 million that has been thrown at the Metrolink with so little scrutiny. One problem which the Metrolink is running into which won’t be a problem with the Western Rail Corridor is the acquisition of land. The reason is simple – the train lines remain in place since services ceased on the old corridor in 1976 and the State owns all of the property that goes with it which is a huge factor in favour of the Western Rail Corridor. 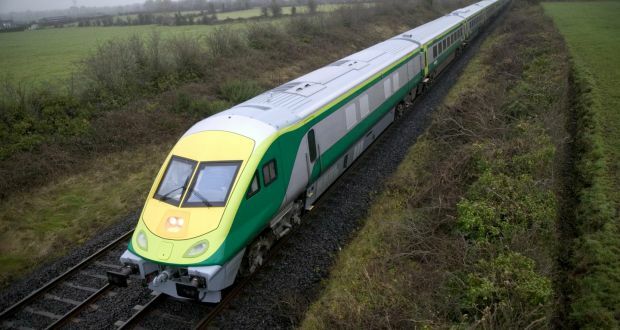 With rail considered the best route around carbon emissions problems – recall Ireland is way behind hitting their 2020 targets – it seems bizarre that plans to connect Galway and Mayo by rail are only receiving lukewarm support. There’s almost half a million people between the two counties and the inter dependency between the two counties is huge. Think of the number of Mayo people who study and work in Galway. It is the city we naturally gravitate towards. Opponents will ask for numbers to prove a critical mass. Well, firstly, if services in the west of Ireland were based only on critical mass, we would have no rail service to Ballina or few bus services at all. But if Government wants to achieve balanced regional development, they need to put their money where their mouth is to facilitate it happening. And infrastructure should come before, not after, development of the regions. But we will make the case for the Corridor nonetheless. There are, according to the 2016 Census figures, 1,326 people who commute from Mayo to work in Galway city or its suburbs. That’s before you consider commuters from Tuam who drive to Galway city every day. All told that’s a sizeable number of people who have to get into their car and travel to Galway every single day of the week. It goes without saying that not all of them would go by rail if that option existed. Depending on where they were in the county of Mayo, rail might not be a quicker option even if the Western Rail Corridor reopened. They might need their car for work anyway. But for those for whom rail would be a viable way of commuting, imagine how much easier their trip to work could be? Sitting down on a train, you could work on your laptop, read a paper or just relax. Consider how much more financially viable third level college could be for students who could commute via rail from Mayo to NUI Galway or GMIT rather than pay high rent prices and living expenses in Galway city. Add in people, especially elderly, who need to go to UHG for vital health services centralised there from Mayo University Hospital. Many more people travel to Galway occasionally for business, to shop or to socialise. The train would be a great option for them and would take more vehicular traffic off the road, which is something we ought to be trying to achieve at every turn. 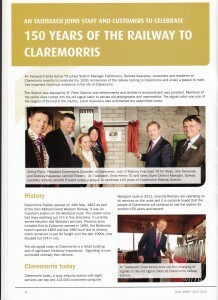 We could go on and on and we have not even explored two huge issues – the benefits to rail freight and the potential for tourism growth by reopening the Athenry to Claremorris line. The current Government have talked a lot about the need for balanced regional development and there has been some delivery on that, most recently the Turlough to Westport road. One wonders how much delivery there would be were it not for the input of Westport-based Minister for Rural and Community Development Michael Ring, who has always sought the best for his county. Minister Ring, like the majority of west of Ireland TDs, are broadly favourable of the Western Rail Corridor. The facility has broad, cross-party support. But the Government need to seize this issue firmly, with or without European funding support. The case for the extension of the Western Rail Corridor is a strong one. Let’s see if the Government are truly serious about the west of Ireland or if the review announced is just another way of kicking this can down the road. An application for EU funding for transport projects in the west and northwest was dropped following the intervention of Leo Varadkar when he was minister for transport, newly disclosed documents reveal. Projects such as the western rail corridor and the upgrading of Galway and Sligo airports were deleted from an EU-wide transport programme in 2011 at the behest of Mr Varadkar, according to the documents. The change went ahead despite Mr Varadkar being warned by a party colleague that it could close off the projects from EU funding “for good”. The current Government, which includes a number of Independent Alliance TDs from western constituencies, is now seeking to reverse the exclusion of western projects from the European Commission’s Trans-European Transport Network (Ten-T) programme. However, the documentation obtained under freedom of information shows this has been stalled by a need to “assess the implications of Brexit”. Mr Varadkar’s decision effectively deprived transport projects north of Limerick of any prospect before 2030 of qualifying for EU funding under criteria which dictates there must be a rail, road, air, sea and cross-Border elements. The Ten-T programme has renewed relevance for Ireland in the context of Brexit, as it provides potential funding for direct transport links to the European continent. In early 2011 the Fianna Fáil minority government submitted the western/Atlantic road and rail cross-Border route from Cork to Derry, including the Limerick-Foynes rail line and the N69 Limerick to Foynes road, for Ten-T approval, the documents show. Let’s have a little courage! This newspaper’s recent editorial on the proposed greenway along the route of the Western Rail Corridor has provoked a lot of hot air on social media forums; indeed, more hot air has been generated than would be required to run several steam engines along the 115-mile route from Limerick to Sligo. Much of the commentary – if one could even label it that – is little more than the ramblings of a petulant peloton who are outraged at the notion that in a democracy there might be somebody who disagrees with their particular point of view. Indeed, Donald Trump’s early morning tweets seem positively sane in light of some of the recent statements from these wannabe cyclists. Thankfully, the position of the greenway promoters has been articulately and cogently expounded by John Mulligan, and this newspaper is more than happy to publish his exposition, not least because it offers an opportunity to critically analyse the proposal for a greenway through the heart of our province. Mr Mulligan cites the Deise Greenway as an example of what could be achieved with the Western Rail Corridor were we to turn it into a greenway, and posits the question: were the promoters of the Deise Greenway ‘misguided’? The answer to that is, of course, ‘no’. However, had the Deise Greenway campaigners sought to construct a cycle path on the rail-link between Waterford and Dublin, they would most certainly have been ‘misguided’. And therein lies the problem with Mr Mulligan’s thesis. The Western Rail Corridor is not even remotely comparable to the Deise Greenway or the Great Western Greenway in West Mayo. It is a closed regional line, connecting two urban centres and potentially an international airport. If we are to accept the Government’s contention that it intends to invest heavily in regional population centres like Galway and Sligo over the next 20 years, then we must also recognise the importance of the Western Rail Corridor in an overall plan for our province. The idea that we would allow these flagship urban centres to be connected by a cycling track is not just misguided, it’s mad. That rail line has the potential to play a crucial role in creating a new commuter society in towns like Claremorris, Kiltimagh, Swinford, Charlestown, and Tubbercurry. People may work in Galway or Sligo but they will be within a convenient commute of their place of employment, provided Irish Rail gets its act together and invests in high-speed trains. Mr Mulligan reminisces at length on the railways of the American Wild West, so much so that one wonders if he has been watching too many old Westerns. Rail transport has actually modernised considerably in America since those far-off days when Jesse James and his band of merry men were robbing the Glendale train, and the country’s rail network – far from being consigned to a dim and distant past – remains a crucial part of its transportation system. Indeed, countries like Japan and Germany, who would hardly be regarded as slouches when it comes to embracing. a ‘forward-looking’ economic philosophy, continue to invest heavily in their rail networks, and it is troubled economies like Argentina, which closed much of its network during the military junta of the 1970s and 1980s, that have abandoned a tried and test form of transportation. Mr Mulligan also refers to “dirty industries” coming to the West of Ireland from China. Nobody has mentioned anything about “dirty industries”; in fact, Ballina Beverages was cited as a current example of the importance of rail links in the West of Ireland and it could hardly be described as a “dirty industry”. However, we could take something from China that might prove useful in a reimagined West of Ireland – some high-speed trains that could herald a new era of rail commuting in Connacht. The proposal for a green way on the route of the Western Rail Corridor is not only misguided, it is hopelessly defeatist. The premise of many of those who promote it seems to be that if we cannot get a slice of the national cake we may as well make do with the crumbs from the table. Had our ancestors adopted such an attitude they would have taken to the bed after the 1916 Easter Rising instead of going out into the hills and valleys of Connacht to secure political independence for those who came after them. How we use that hard-won independence in the 21st century will ultimately dictate how we are viewed by the generations who come after us. Building a cycling track through the heart of our province is the easy option but it would be tantamount to a betrayal of those who campaigned so vociferously for western development since the foundation of the State. We owe it to them to have a little more ambition, courage and belief in ourselves. Patronage on the Galway Limerick Intercity rail line has soared 22% in 2016 pointing to annualized passenger numbers of 420,600. The annual rail survey by the National Transport Authority finds that 1,402 people travelled Galway-Limerick on census day, 17 November 2016, an increase of 22% on 2015. With rail passengers counted six days a week throughout the year, this would equate to 420,600 passengers in 2016. The Business Case for Galway-Limerick had projected 220,000 by 2020. In fact, patronage has almost doubled – fully three years earlier than projected. And while rail travel nationally is up 19% between 2012 and 2016, the increase for Galway-Limerick is 38%. Claremorris Chamber of Commerce has called on the Government to sanction the planned motorway between Galway and Mayo in its forthcoming capital spending plan. 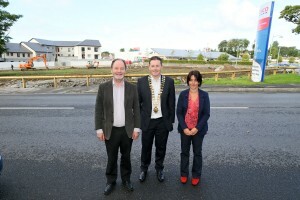 Ahead of the opening of the M17-M18 Gort-Tuam motorway on Wednesday 27 September, the business group said plugging Mayo into the national motorway network would be a huge boost for regional development. “The original plan was to build the motorway from Gort to Claremorris”, said spokesman Kealan Flynn. 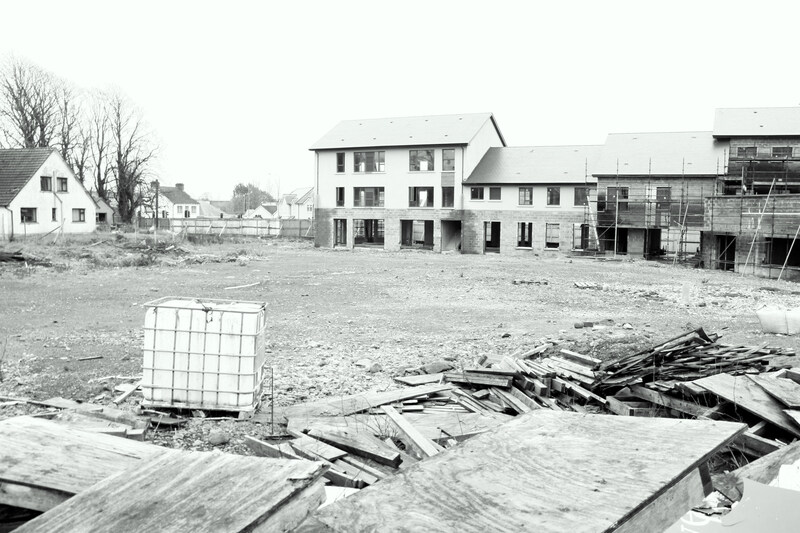 “With Gort-Tuam now open, and an extra €4 billion for capital spending, money is not a problem. The Design Report, EIS and CPO documents for the 28 km from Tuam to Claremorris are done. The CPOs could be issued today. 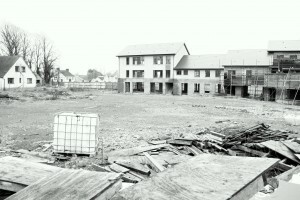 The next stage of the Atlantic Corridor could be open 18 months after the first sod is turned. A short stretch from Claremorris to the N5 – and Castlebar and Westport would also be linked to the national motorway network”, he added. The Government has pledged an Atlantic Economic Corridor to enable the west to catch up the east. 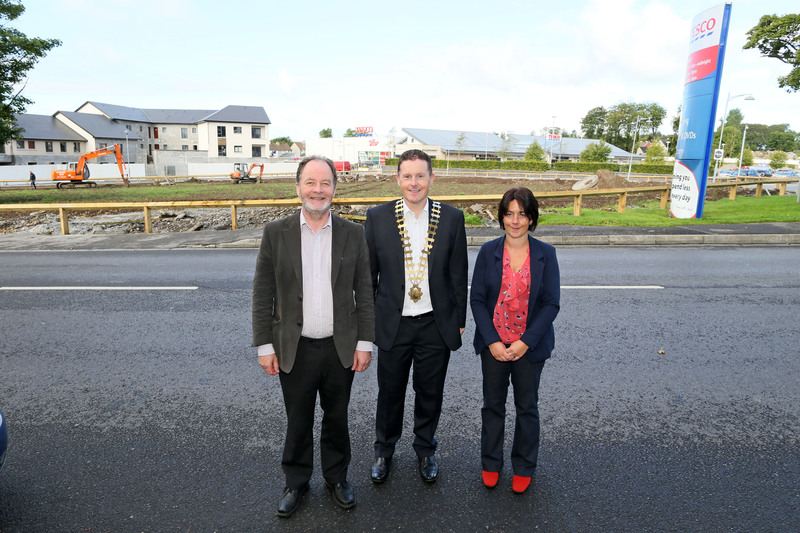 With the Cork-Limerick motorway a national priority, a three-city region – Cork, Limerick, Galway – is taking shape. Extending the motorway from Galway, first to Mayo and then to Sligo, pulls in the west and north-west, and puts an all-island, post-Brexit economy within reach. The Atlantic Economic Corridor is supported by 2,250 Irish-owned and multinational firms employing 73,500 people in the west, mid-west and north-west regions. Claremorris Chamber of Commerce is calling on the Government to ensure the west and north-west regions get a fair share of the spend from the capital plan due by year-end. Pictured as the finishing touches are applied are Eugene Waldron, Jimmy Flynn and Sheila Hunt of Claremorris Chamber. will cut the journey time to Galway in half. have successfully done for this one. including industrial-grade electricity, broadband and natural gas connectivity. and connectivity to Corrib when it comes on stream. Land of the GIANTS Duathlon 2018 Launched! Brave hearts at the Land of the Giants Duathlon 2017!